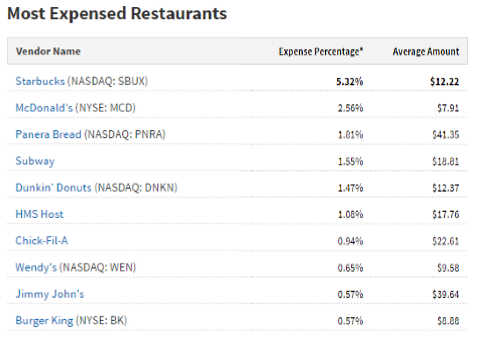 McDonald's came in second on the list, but Starbucks gets expensed almost twice as often as Mickey D's. If you travel often, you know your options are limited. You might have the time to seek out exciting food and drink experiences wherever you’re going, but what if you don’t? Also, what if you’re stuck in an airport for hours (and it’s unfortunately not JFK Terminal 4)? You have to eat and drink somewhere. Certify, a leading maker of expense report software, just recently released its latest quarterly report analyzing corporate travel and entertainment expenses. Starbucks remains the food and beverage brand most often expensed. Business travelers expense Starbucks 5.32% of the time, and spend an average of $12.22 at the chain. Makes sense, given the convenience, caffeine, and free Wifi. Check out the full list of Most Expensed Restaurants. We can observe a few things from this list. Certify notes that business travelers most often eat breakfast at Starbucks and eat dinner at McDonald’s; neither of those things is particularly surprising. But why an average of $41.35 at Panera? We’d guess either team meetings at Panera itself or in the hotel, where someone’s picking up an assortment of breakfast items for the whole team and bringing them back to a conference room. This meal could potentially involve clients, but seems more likely to be team-oriented. Panera’s decent, but not a place where you take clients that you want to impress. As Eater points out, HMS Host is a company that owns many random franchise locations throughout international airports. You may have thought you just bought your lunch at Burger King, but that Burger King might actually be owned by HMS Host. The only way you’ll notice is if you look at your receipt—which you probably only do if you have to submit an expense report. The other important thing to note here is that chains—rather than stand-alone restaurants—are always going to top this report. Frequent travelers who care about food know that some airports have great food options now. For example, we always make a point to hit up Tortas Frontera when we’re going through ORD (whether we’re expensing it or not). But even though there are a couple locations of Tortas Frontera, it’s never going to compete on the level of a Starbucks or a McDonald’s, just by virtue of sheer volume.